After working Saturday through Wednesday I was looking forward to having Thursday off. I was going to sleep in, run errands, and get a lot done around my apartment. It was going to be great. Unfortunately it didn’t quite work out that way. When my car started making some weird scratching noises on Monday I decided I really should take it in for service on my day off. Not the most glamorous use of my free time, but necessary. Actually, much more necessary than I imagined. Turns out the transmission is shot in my not quite 10 year old SUV. When the service rep sat down next to me in the lounge and said the word “transmission,” I knew it was going to be bad. And very expensive. But I left the dealer only paying for an oil change. There was no way I was going to commit to dumping five thousand dollars into an aging car that’s not worth much more than that in its current condition. To make sure the dealer wasn’t taking me for a ride I took my car to Aamco for a second opinion that afternoon. They agreed that the transmission was the problem, but they wanted to rebuild it rather than a complete replacement. The estimate for something like that was around three thousand dollars, minimum. That wasn’t enough of a savings for me to consider the repairs, though. I left Aamco paying nothing, despite the guy at the front desk trying to convince me otherwise. I know what the car is worth, and I’m just not willing to spend that much money on it. Better to save it for my next vehicle. So as much as I hate to admit it, I suppose I’ll be looking to buy a car in the near future. I was really hoping that my car would make it to it’s tenth birthday (September 15th), but it looks like that’s not going to happen. It’s so frustrating. The transmission in a Honda shouldn’t be falling apart this soon! I can’t complain too much since I haven’t had any major problems with my CR-V in nine and a half years, but I still wanted to keep it for a little longer. I guess I’m just not mentally prepared to buy a new car yet, but mechanical problems have forced my hand. So sometime next week I’ll start searching for a new set of wheels that I’ll hopefully be driving the next decade. Big changes are coming! I have a lot of co-workers who are runners so we discuss training, races, and injuries quite often. After complaining about my knee problems to one of them, she gave me the name of the sports chiropractor that she and several others have gotten positive results from. And since I’d like exhaust all solutions that don’t involve drugs or surgery before taking more drastic actions, I called and made an appointment. I’d never been to a chiropractor before so I had no expectations when I first walked into the office last Monday. All I knew about the profession was a bunch of stereotypes involving back cracking that I’d seen on television. Since I was going to see this guy about my knee I was fairly certain my appointment wouldn’t be anything like that. The big surprise was how much it hurt! The treatment was more like deep tissue massage than anything else. Like deep enough to cause bruising. Yikes! It was very unpleasant, but I was hopeful that it would be beneficial in the long run. Unfortunately there was no immediate payoff since my knee didn’t hurt unless I was running. That was a little frustrating. I went back to the chiropractor on Thursday for a follow up, which was a much shorter appointment, but still painful. He told me to come back a couple of times this week as well. I still wasn’t feeling significant progress, but I figured there was no way these sessions could be harmful. Then there’s the Surf City Half marathon in Huntington Beach yesterday. What a mess. I hadn’t attempted to run at all since the Star Wars 10K over a week earlier so I wasn’t sure how my knee was going to feel. 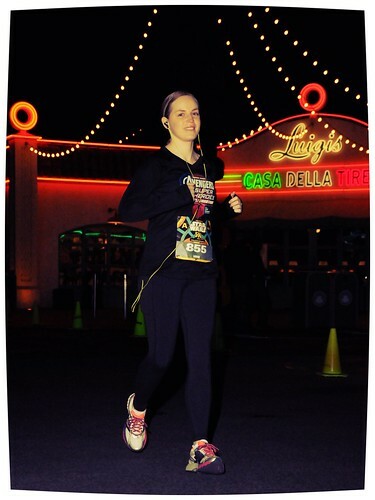 I was nervous that even after two weeks of rest it wasn’t going to have improved at and that every step of the 13.1 miles was going to be miserable. Turns out I had good reason to be worried. When the race started I got a false sense of security because my knee felt pretty good for the first two miles or so. After that everything started to fall apart. I was able to alternate between running and walking for a while, stopping every half mile or so to stretch my legs. I thought I might be able to keep that up for the rest of the race. I was wrong. At mile 8.5 or so I lost it all together. I walked the majority of the rest of the course because I was in so much pain. It was indeed miserable. I felt like such a fraud collecting my medal after crossing the finish line because it took me significantly over 3 hours to complete that half marathon. Pathetic! But let me explain why running this race today was so important to me. 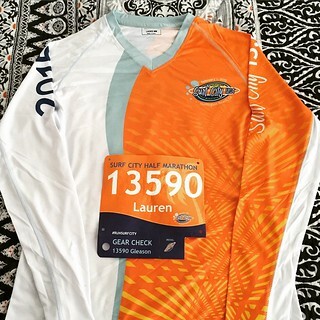 The Surf City Half Marathon is the first step of the Beach Cities Challenge, which also includes the OC Half Marathon in May and the Long Beach Half Marathon in October (both of which I’m already registered for). There was absolutely no way that I was going to screw up my chances at completing the challenge in 2015 by missing the first of the three races! I would have regretted that more than any injury caused by participating. Hopefully my obstinacy won’t have lingering ramifications. Only time will tell. So I’m wrapping up this little tale today, but the issue has by no means been resolved. I have two more appointments with the chiropractor this week so we’ll see if that helps at all. At this point I’m considering seeing an orthopedist. As much as I don’t want to admit it, my knee might need more serious attention. I’m sitting on my couch in pain for a completely ridiculous reason. Over the weekend the smoke detector in the hallway right outside my bathroom went off while I was in the shower. This has happened a couple of times in the past and I think it’s due to the steam. It’s very annoying. I had to jump out of the shower (dripping water all over the floor), drag a bench from my bedroom into the hallway (after moving a bunch of books and clothes off it), wrestle the smoke detector off the wall, and remove the battery. Geez. After I finished my shower I probably should have put the smoke detector back on the wall, but I left it dismantled and forgot about it. Then on Tuesday as I was enjoying a nice hot shower after my evening run, the smoke detector in my guest bedroom started going off. I was so frustrated! Having to run around soaking wet to shut off an ear piercing alarm will definitely ruin your day. Not only that, it can be hazardous to your health, as I’ve discovered. You see, I had to drag the heavy bench from my room into the guest bedroom, which is up a couple of small stairs. As I lifted the bench to get it up the stairs I thought, “This is going to be bad.” I didn’t know how right I was until this morning. The right side of my back hurt with every movement and with every breath I took. It was miserable. I took some ibuprofen and applied my heating pad for a while, but I only got marginal relief. Unfortunately I couldn’t take the day off because I had too much to do at work, so I eventually lurched around enough to get dressed and ready to leave the house. Let me tell you, computer work is not the best thing for a sore back. I grunted and groaned my way through the day until I could go back home and relax my aching muscles. Needless to say, my evening run will have to wait until tomorrow, at least. I’ll heal in a day or two, but the bigger problem is that I have two disabled smoke alarms that will go off in the vicinity of a hot shower. I need to find a solution for that. But for now I’m going to spend some quality time with my heating pad before I go to bed. Ouch! I spent my weekend in flip flops because those are the only shoes I could wear comfortably at the time. This is due to some new running shoes I tried last Sunday that destroyed my feet and made putting on just about any shoes painful. That meant no running or even much walking for a while. It was incredibly frustrating. So how did this happen? I’ll tell you. I took a personal day off from work the week before last because I had a few things I wanted to get done – specifically, get some new running shoes. My ankles hurt a bit after the Seal Beach 10K two weeks ago and the pain only got worse during my two runs following the race. I was convinced I needed new shoes because nothing I’ve tried so far has worked for me. Out of desperation I went to two different stores to get some options. The first place I went was the New Balance store at South Coast Plaza. Not that I’ve loved what I’ve purchased there so far, but being able to get running shoes in narrow widths is what keeps me going back. Wishful thinking, perhaps, but let’s move on. After explaining my problems the salesperson brought me a pair of their new Fresh Foam 980s. I wasn’t expecting much, but they felt really good when I tried them on and walked around a bit. And since they weren’t too expensive I bought them to at least try. I’ve already spent so much money looking for the right running shoes – what’s a little more? Maybe if I kiss enough frogs I’ll find my prince one day. And by “prince” I mean some shoes that don’t kill my feet when I run! But I digress. When I left the mall I went to Snail’s Pace, a running store in Fountain Valley, because I thought they would have many more options to alleviate my ankle pain. On my first visit there I got the Nike Zoom Structures that I absolutely hated so I was hoping for a different outcome this time. I explained my situation to yet another salesperson and he assured me that I need stability shoes to correct overpronation (despite my reservations). I tried on three different pairs and ultimately chose the Adidas Adistar Boost shoes. To make a long story short, I ran six miles in them and they destroyed my feet (as I alluded to in the first paragraph). I didn’t even realize the extent of the damage until I put on the shoes again three days later. There’s a piece of plastic on the exterior of the heel for structure and stability that must have dug into my heel bone and bruised the hell out of it. It was so painful that I almost started crying when I tried running in them again. Those suckers are going back to Snail’s Pace this week for sure. As of this evening I think my feet are finally feeling good enough to try running again (in some different shoes, obviously), which is good news because I’m supposed to start my half marathon training plan soon. I will try the New Balance Fresh Foam shoes tomorrow and see how they work for me. One thing’s for sure, they can’t be worse than the Adidas! Yesterday was the first day of 2014 that I didn’t update my webpage, but I think I had a good excuse. My surgery was yesterday, and even though it went very smoothly and I didn’t feel too awful afterwards, I was really tired last night. I’m still feeling wiped out tonight, but I wanted to write a little something anyway. My mom, dad, and I arrived at the hospital at 5:30 AM yesterday for my 7 AM surgery. I didn’t get to talk to my doctor after the operation, but she discussed it with my parents when it was over. She removed two ovarian cysts and discovered that I have endometriosis. That surprised me a little because I thought it was ruled out when I was eighteen. My doctor said it was a mild case, but it was there. Lucky me! After the procedure and about an hour in recovery, my parents drove me home to get some rest. The anesthesia made me feel pretty gross, but we got some lunch from a local restaurant before I took a nap in the afternoon. For dinner we went to Ruby’s because my throat was hurting and I wanted a milkshake. I went everywhere yesterday in some old yoga pants, a sweatshirt, and flip-flops. There was no way I would have been able to wear jeans over the three incisions I have in my abdomen now. Ouch. I even hurt myself turning over in the middle of the night. The pain didn’t last too long, but it still kept me awake for an hour before I could go back to sleep. When I got up this morning I realized that my sore throat was the beginning of a head cold and not just a side effect of the surgery. Of course I would get sick when I’m already taking time off from work for medical purposes. When it rains it pours, huh? Besides the cold I was feeling pretty good today. My incisions are tender to the touch, but I’m otherwise not in very much pain. My parents helped me with some errands today after I finally got up and showered (I was glad to wash off the orange Betadine that was still all over my belly). First we went to the Social Security office to start the process of changing my name back. That was a success and I should get my new Social Security card with my maiden name on it in about two weeks. After that I can go to the DMV and start updating credit card accounts, utilities, etc. I’ll be glad when that’s all over, but it was great to at least take the first step today. Our next stop was Ikea to get a little shelf for my bedroom. The three of us also had lunch of Swedish meatballs, mashed potatoes, and ligonberry sauce at the Ikea café. Delicious. Unfortunately I was wiped out after those two errands so we went back to my apartment so I could take a nap. The rest of today was very low key because I had overextended myself earlier. Now it’s time for me to sleep again and hopefully heal some more. I’ll be glad when it doesn’t hurt my stomach to sit down and stand up again!